Portugal's Crónica label presents a captivating showcase from Montreal-based electro-acoustic composer, Nicholas Bernier. His work here is defined by a predilection for the glassiest, most tensile string sounds, exploring a range of piercing hi-end frequencies with an innately tactile sensuality. 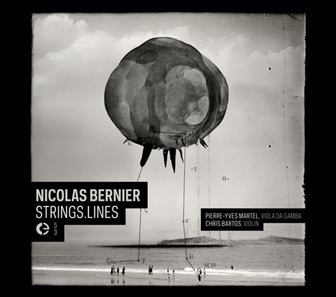 The shortest of these, 'Line (Strings)', sets a filigree balance between organically textured sound and ultra-subte digital processing, manifested in a tense, tentative opening. 'Line (A)' is more dynamic, electro-acoustically speaking, expanding his range of textures and sonorities to perfume the space with intensely sharp highs and distant granular crackles forming into drifts of neo-classical moods. 'Line (B)' is more sublime and tender with a magical flourish of harmonics hidden at its core, while 'Line (C)' introduces fragile, clipped rhythms. 'Lines (Horizon)' is the most full-bodied of the lot, fleshing out the lower registers with hovering grey drones while the foreground subsides from shards of sustained strings to slowly bowed cello. Sublime.